Woohoo happy to be riding the back roads today and I tell you they were SUPERB! Last night we had a look around town and just at the back of the park is a conservation area where Kouta found himself a wallaby and no matter how many kangas, wallabies or animals in general we always get a kick out of them and act as though it is the first one we have seen! When we entered the town there was a sign saying 'landrover up a pole' so we found it at the east side of town. not quite sure what the connection between the landrover and the people who developed the surrounding land. There were alot of caravaners last night at the Keith Caravan Park - more than we had anticipated. We both had a restless nights sleep last night as the local pub had a DJ and unfortunately the music carried throughout the town and you could hear the music at 3am in the morning ... and to answer EVERYONES next thought (and I know you all thought about it!) no I didn't march up to the pub to tell them to turn their music off (or turn it off myself!!) and everyones keys were safe last night! 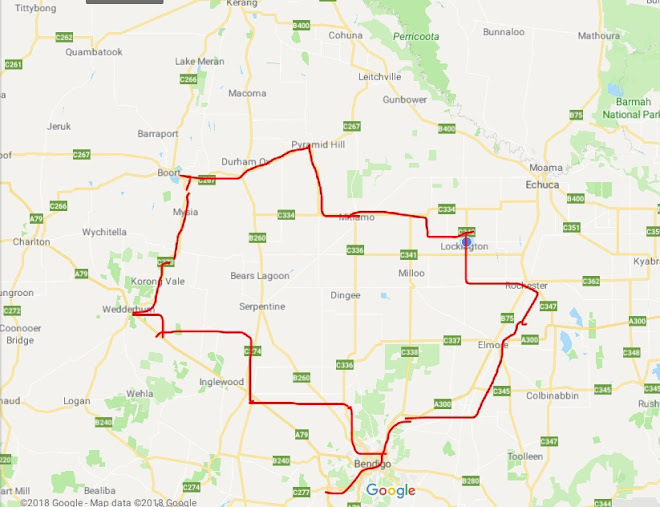 Todays ride was 15km longer going via the back roads - first you head south for about 11km along the highway that goes to Naracoorte and then turn left onto Carew road and this goes for another 20km in a east and then south direction and comes to an intersection or Canniwagara road at the 31km mark you turn left and go east to Bordertown another 27km away. 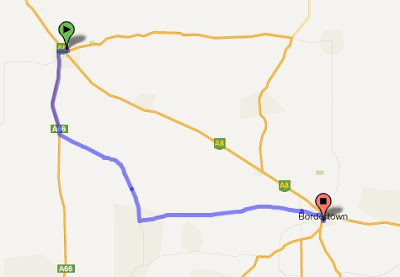 The wind today was a south south westerly so a headwind for the bulk of the first part of the ride. Once we turned to go east we had a cross tailwind so we managed to go a few extra kms faster. It is reasonably flat although you do climb gradually but you don't notice it! We did stop for a cuppa at Carew which consists of a house and a disused tennis court which still had the gate locked despite the state of the rest of the tennis courts! LOL - everytime we see a tennis court like this (in a state of disrepair) I get the same lament from Neil "ah there was a time when the tennis courts in each small town was the life of the town ..." or something like that. Bordertown is a reasonable size town and has a population of around 2700 people so Neil was happy with the markdown in the supermarket!